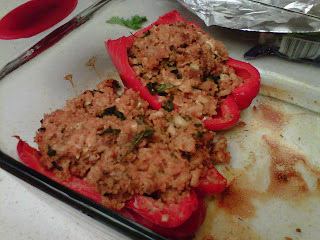 I made stuffed peppers last night - they were so good! And really simple to make! And the boyfriend actually liked them! Success all around. And, as for the Recipe below, enjoy my lengthy commentary on each item, which will make it nearly impossible to print out this recipe as a nice compact little list. HA! Total additional Prep. Time – I dunno, how fast do you chop onions and wash peppers?! 1/2 cup uncooked quinoa (or brown rice, or couscous) – I had intended on using quinoa, but APPARENTLY Albertsons doesn’t have it – more of a Trader Joe’s thing, I suppose. So I used whole wheat couscous, which was great. onion - (chopped finely) I had half of a shallot lying around, so I used that. Some onion tears may have been baked into this dish. Ack. 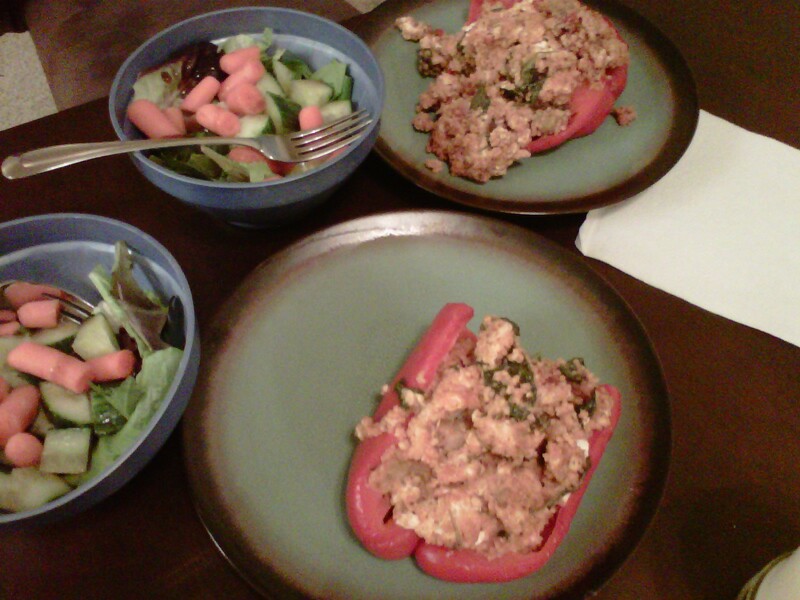 6 oz ground turkey – those packages at the store are 20oz I think, so just guesstimate how much. It doesn’t really matter too much. 1 cup fresh baby spinach leaves – that’d be 1 gigantic handful of the raw leaves from the pre-washed salad bag. 1) Slice tops off peppers just below the crown. Pull out seeds then rinse peppers quickly under running water to remove all remaining seeds. (Cut out that gross white part by the seeds too with a paring knife, ok?) Cut in half lengthwise (so they are little cups, see photo so you don’t screw this up!) and put in a casserole dish with a lid (or foil worked fine!...who has lids?!) Put the dish in the oven with the lid on. 3) While peppers and grain are cooking, Heat a large sauté pan over medium heat. Add a bit of olive oil. Sauté onion and garlic for about 5 minutes until translucent. Careful not to burn the garlic. I said careful!!! Add ground turkey and sausage. Using a spatula or large spoon, continually break ground turkey into smaller pieces as it cooks. Add a sprinkle or two of salt, pepper and Italian seasoning. When turkey is no longer pink and just begins to brown, add tomato sauce and spinach. Mix well into turkey. (Try to mix the spinach under the other hot ingredients, so it wilts more quickly) Cook 1 more minute then turn off heat. 4) Add turkey mixture to quinoa (or vice versa, whichever pan is bigger!). 5) Add crumbled goat cheese. Mix well. 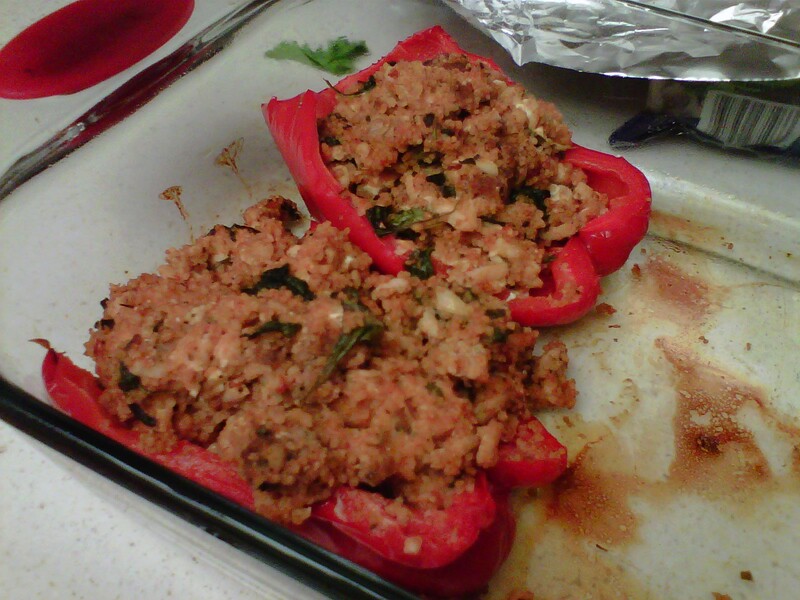 Scoop quinoa-turkey mixture into the peppers, packing the peppers full. Spoon remaining quinoa around the sides of the peppers. (That is a cop out – pack it all in!) With the lid on the casserole dish, Bake for another 20 minutes. Remove from oven. Let sit five minutes before serving. I served with a mixed green and cucumber salad. Despite this lengthy novel, it is super yummy and easy!